(2 Oct. 1452 – 22 Aug. 1485) Art departs from life? 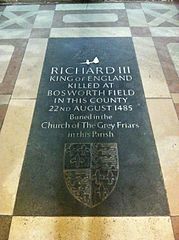 Buried (again) in March 2015, Richard III, dug up from a Leicester car park, was given a reverential cortege and buried in Leicester Cathedral. The Tudors would be spinning in their Westminster caskets. 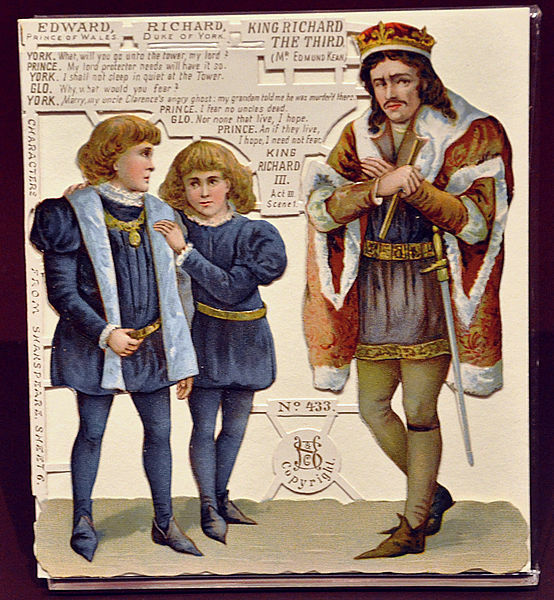 Despite the efforts of Horace Walpole, Josephine Tey, and the Society named after him, the infamous scoliotic usurper has received a rather bad press since those kids, Edward V and his younger brother, Richard, Duke of York, ‘vanished’ from the Tower in 1483, and his death at Bosworth Field two years later. I think that the bad thoughts about this good man started with the potboiler Shakespeare. I think that Skakespeare is a prick! I think that Shakespeare is a prick!